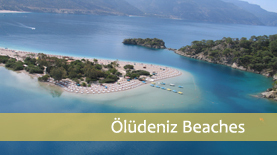 Calis beach is located 5km along the coast from Fethiye town and comes alive during the Summer season, providing an excellent choice for a perfect relaxing holiday. The 2km promenade along the beach is lined with restarants and bars to accomodate all tastes. Sunsets are spectacular from here! Don\'t be tempted to go into the first restaurant you see. The locals are very friendly and will be encouraging you to sample the delights of their restaurants everywhere you go. There are many ways to get into Fethiye town. You can get a \'Dolmus\' - a small white privately owned minibus - from outside the Aquapark. They run approximately every 10 minutes. There will be a small green sign in the windscreen that says \'Fethiye\'. A taxi rank can be found next to the roundabout on your way to the beach, but by far the most enjoyable way into Fethiye is via the water-taxi\'s down by the river in Calis. 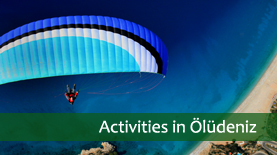 These take you across the bay to Fethiye harbour. Small shops are everywhere selling basic daily essentials but for a wider selection there is a supermarket located about 1000m past the Aquapark on the left-hand side. Every Sunday the Fethiye market comes to Calis. To locate the market turn right out of the villa\'s front door towards the main road. Turn right again along the main road and first right again. It\'s approximately half a mile down that road..